Most women will have an area or body part that they wish they could change, right? On a daily basis this doesn’t cause un necessary issues however your ‘big day’ is a special occasion when all eyes are on the bride and groom. EEEK it’s time to take a big gulp and take center stage, your on – ta da. So you have hips you’ d like to hide or a tummy that makes you feel self-conscious? (You are not alone don’t worry). When looking in wedding dress shops it would be worth mentioning any areas you are not so confident about showing off and equally think about the parts you do like. Remember if you feel comfortable & happy with your appearance you will feel & act more confident and that’s exactly how is should be on your wedding day – after all the day is about celebrating you and your other half! See which of the below body shapes you identify with as this is a good starting point when you begin your wedding dress search. The triangle shape is also known as the pear shape. This is recognised by fuller hips and/or thighs in comparison to the shoulders and bust. There are many ladies who would like to have slightly narrower hips & thighs however with the correct dress shape attention can be drawn away from the hips and voila! • Emphasis the shoulders to widen them thus creating a balance. • Emphasise the top half in general, Detailing higher up will do this. A-Line styles will skim the hips and disguise a triangle body shape creating a balanced silhouette. Empire styles will draw the attention upwards and the skirt will then flow right from under the bust to the floor. A Ball gown will work as long as the waist line isn’t too low or the skirt will start right on the hips. 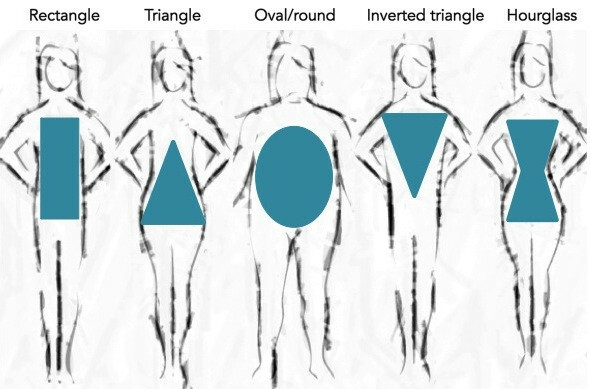 The Inverted Triangle shape is recognized by a broad shouldered frame with the hips being narrower. An inverted triangular frame can easily look top heavy or masculine. However don’t worry, as it is easy to create a point of interest & focus on lower areas to achieve a balanced shape. When you shop for your wedding dress, pay lots of attention to the bottom half to give you balance and proportion. • Skirts that flare from the body will create a balance with the width of the shoulders. Ball gown style dresses will show symmetry by balancing out the wide full skirt against the shoulders. Mermaid or trumpet styles can work only if the skirt flares out enough to create a balance with the shoulder width. Short styles that flare from the waist down & draw attention to legs and of course some special wedding day shoes! The Hourglass shape is easy to recognize with equal defined hips & bust and a nipped in narrow waist. There are more choices of gowns that will perfectly suit an hourglass body shape however that does mean making a choice may be more difficult than you first thought. Oh its hard work trying on pretty dresses all day let me tell you! • With this enviable silhouette shape you are a bridal designers dream so you can literally wear any style. Sheath styles are very slim & elegant and will look sleek on an hourglass shape. A mermaid/trumpet style will show off your curves the most out of all the wedding dress styles. A ball gown will suit a curvy hourglass perfectly showing off the curves of the bust & waist & then va voom in to the skirt. The round or diamond shape also known as the apple & oval body shape. Characterized generally by a rounder shoulder line, an average to bigger bust with fullness around the middle. Your weight tends to distribute mainly around the waist & sometimes the bust. The aim is to slim down the silhouette and create a straight up and down shape. 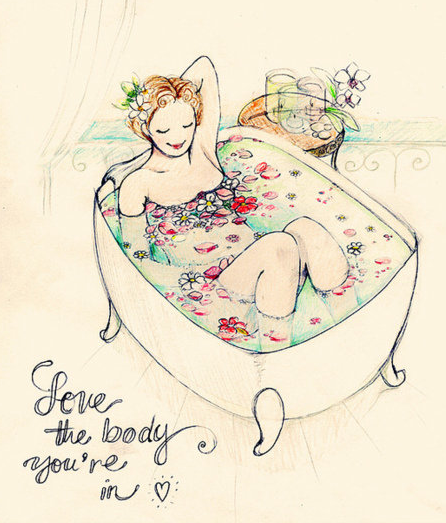 Think about which areas of your body you favour and would like to focus on and lets draw attention there. • Focus on the shoulders to create height & width. Straps & capped sleeves are good for this. • Try on dresses where the skirt flows directly from under the bust line as this completely bypasses the waist & creates a balances shape. • Remember a lace up back dress will help pull in & hide a tummy more than a zip up back. An A-line style dress will be great as it will hide & flatter a tummy especially if coupled with lots of detail higher up. An empire waistline will cinch in under the bust & flow freely to the floor avoiding the middle section & emphasise the bust. A ball gown style will work also as long as the waist starts high up & not at your widest point. The rectangle shape can sometimes referred to as a sporty figure. A rectangular shape is recognized by even hips & bust little if any waist definition. Weight gain goes relatively un-noticed as it is distributed evenly from the hips through to the bust. Leaner shapes tend to lack natural curves and so a any bridal gown that helps create a curvy silhouette will be a winner. • Try dresses that pull in at the waist yet are the same widths at the top and bottom as this will help create an hourglass silhouette. A-line style dresses will cinch the waist and give the illusion of curves. An Empire line gown will hug in just the right place and flatter a sporty figure. A sheath style gown may create curves where needed but play around with the necklines if opting for this style. So if you are rearing to go or a little shy about your wedding dress search I do hope this may have given a little insight in to the shapes & styles of dresses you will come accross. There is a dress out there for every bride you just have to know what to look for and not be scared to try on styles you didnt originally imagine yourself wearing.